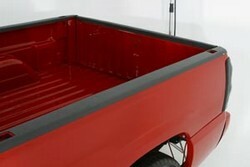 For added protection to your truck bed, add Wade Bed Rail, Front and Tailgate caps. You can choose the style that you like best to give your truck a great custom look. Most Wade rail applications are available in either a smooth or a ribbed design. You can also complete the look by combining rail caps with matching front caps and tailgate caps. * Combine with matching Wade ABS Tailgate and Front Bed Caps for complete protection of your truck's bed.